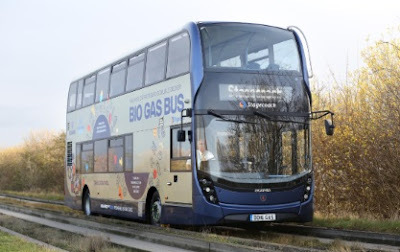 Stagecoach East is testing a biogas-powered double-decker bus on the Guided Busway A and B services between Huntingdon and Cambridge. The six-week trial of a ‘greener’ Enviro 400 Scania double-decker is taking place and, last week, the bus company showcased the benefits of running such a bus in real-life service to key stakeholders, local MPs and city council members. The Scania model – which has been specifically developed for the UK bus market - offers a number of advantages which complement Stagecoach East’s environmental goals of improving air quality in Cambridge, and its commitment to sustainable transport and renewable fuels. Using biogas reduces carbon dioxide (CO2) emissions by up to 84 per cent. Travelling in a biogas bus is 50 times cleaner than travelling by car. An average car journey emits 120g of CO2per km while the equivalent journey using a biogas bus only emits around 2.4g per km. Biogas is created from waste products such as household food waste, farm waste and sewage – making it a natural and renewable fuel to produce. Biogas-powered buses additionally help the environment by using products otherwise destined for landfill – reducing the amount of potent greenhouse gases (methane) which would have occurred and been released into the atmosphere if the waste products had been left to decompose naturally. Stagecoach East is committed to delivering greener, smarter travel where it can, and is already making a significant contribution towards reducing its carbon footprint. A specially blended 30 per cent bio-fuel is already used across the entire Stagecoach East fleet – and, at the start of the year, the company invested £4.7million in a fleet of 22 ‘greener’ Park & Ride buses, all fitted with the very latest stop-start technology to prevent them ‘ticking over’ at bus stops. Andy Campbell, Managing Director of Stagecoach East said: “The technology around biogas-powered buses is still very new, but trials of bio-methane gas have proved very encouraging, resulting in minimal emissions. “Looking after the environment is an important consideration for us. We have frequent bus services running every 10 minutes, and so we are actively working at reducing our environmental impact wherever possible.